CONCORD, N.C.— December 9, 2016 — The World of Outlaws Craftsman® Late Model Series is set to embark on its 14th season since 2004. The 2017 World of Outlaws Late Model Schedule is loaded with some of dirt late model racing’s heaviest hitters. The series will travel 21 states and one Canadian province in 2017. The 2017 series schedule features 58 nights of fender-to-fender racing, and the Outlaws will revisit 20 tracks from last season’s tour. Notably, the Outlaws will resume their international stretch through Canada; they have made a total of six stops at Cornwall (Ont.) Motor Speedway and Brighton (Ont.) Speedway since 2012. The series will kick-off the season at Screven (Ga.) Motorsports Park as usual. The Winter Freeze VII on February 17-18 in has been the first stop in four of the last five seasons. Thereon, the late model series will join the World of Outlaws Craftsman® Sprint Car Series and Super DIRTcar Series Big-Block Modifieds for the prestigious 45th Annual DIRTcar Nationals at Volusia (Fla.) Speedway Park. Each series will battle for the coveted “Big Gator” trophy from February 23-25. Within the schedule lies some of dirt late model’s most prestigious events. Lernerville (Pa.) Speedway appears on the schedule four times, and three of those nights make up the fiery Firecracker 100 weekend from June 22-24. Last year during the preliminary races, 2015 Rookie of the Year Brandon Overton was able to land his first career series win. An emotional Overton climbed out of the car in victory lane, paying tribute to his father’s efforts in helping him get to this point in his career. Also on tap is the Prairie Dirt Classic from July 28-29 at Fairbury American Legion (Ill.) Speedway. The 1/4-mile, semi-banked clay oval has been a landing spot for the World of Outlaws since 2013. There, the Outlaws will join late model’s best drivers to build on the 28-year history of the Illinois classic. Another key component to a wide variety of events is the 30th annual USA Nationals from August 3-5 in New Richmond, Wis. The 3/8-mile oval has been a mainstay since the series’ conception in 1988, and offered a season-defining $50,000 payout to the winner last season. Seven tracks will debut in the series, including: The Dirt Oval at Route 66 (Ill.) Raceway, Salina Highbanks (Okla.) Speedway, Cherokee (S.C.) Speedway, Senoia (Ga.) Raceway, Terre Haute (Ind.) Action Track, Oshkosh SpeedZone (Wisc.) Raceway, and Georgetown (Del.) Speedway. With close ties to The Dirt Oval at Route 66, series regular Frank Heckenast Jr. will make his homecoming to a track that has not seen the presence of a late model in nearly 15 years. The track President, Sherri Heckenast, is the sister of Frankfort, Ill. driver. 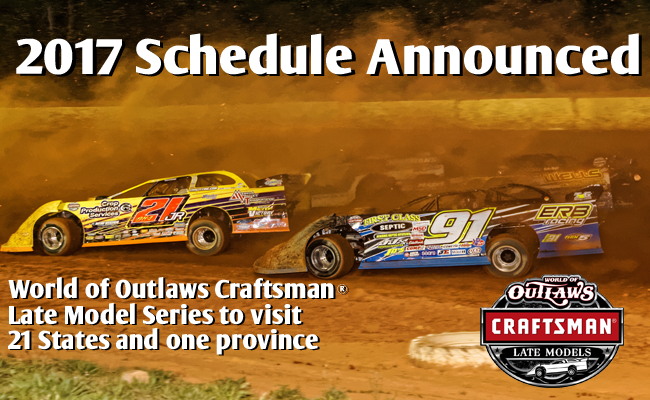 The 2017 World of Outlaws Craftsman® Late Model Series Championship will be sealed at the Bad Boy Off Road World Finals at The Dirt Track at Charlotte on November 2-4. The complete 2017 schedule is listed below and can be found at www.WoOLMS.com. Tickets for select events are on-sale now at dirtcar.ticketforce.com or by calling 844-DIRT-TIX (347-8849).